Hi all, I’m Kate from Quarter Mile Quilts. I’m a traditional-modern-quilter who is addicted to Dr. Pepper and the color blue. (My fabric stash features a dedicated drawer to the color and lately I’ve been “trying” other colors.) By day, I’m a construction project manager and by night a loving wife and sewing enthusiast / fabric hoarder. In my wildest dreams, I would be Batman. 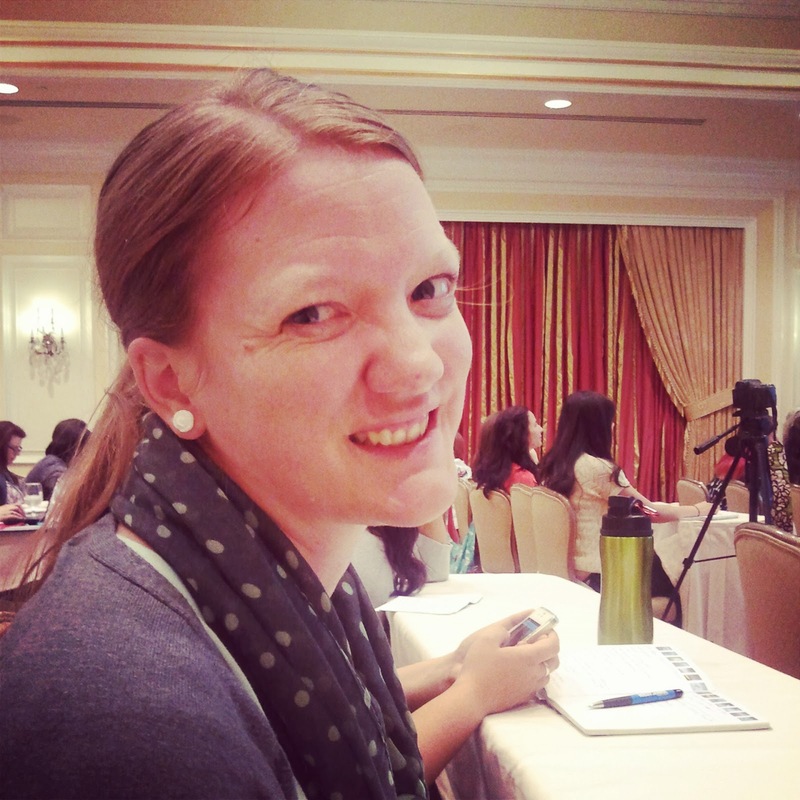 I’ve been following Young Texan Momma for a while and am excited to write a guest post. Today I would like to share a tutorial that is near and to dear to my heart. A Dr. Pepper mini quilt top! 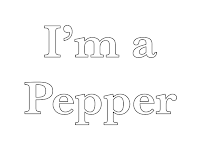 I’m a Pepper, are you? Fusible webbing (i.e. no-sew heat n bond, regular adhesion). 1) Assemble supplies (something you love! - I always find I am more excited when I am using fabric that makes me happy). If you’re not a Dr. P fan, you could always do another soda, or even water using the template and different phrases. 2) Print template for letters and soda bottle. Cut them out of the paper for tracing later. 5) Take black fabric and apply the heat-n-sew or fusible webbing to the wrong side following the product’s recommended instructions. Leave paper and set aside to cool. Repeat for maroon and brown fabrics. 6) Trace templates onto back of fabrics using a pencil. I used a blue pen so that you can see it better. Ensure that you are applying the letters backwards as you are tracing on the wrong side of the fabric. (Of course, if you do a few letters incorrectly, it could just add “character” to your project). Cut out the shapes using small sharp scissors. 7) Take white background fabric and pieces to your ironing board. Layout the soda bottle and lettering in desired position. I laid mine out below to ensure I liked the letter spacing. 8) Peal the paper from the back of the soda bottle fabric pieces. 9) Following the manufacturer’s recommendations, apply the brown soda bottle first. Let it cool for a few minutes and then apply the bottle label and cap. Let it cool. 10) Take to your machine and zig-zag stitch along the bottom and top edge of the soda bottle label and along the bottom of the cap. I would recommend using a brown or maroon colored thread. Once your done that, sew a zig-zag stitch along the outside of the soda bottle. Be sure to carry your stitching just a bit past where you started to help prevent unraveling. Please note that the fusible webbing you used may not require you to stitch after you iron on the fabric. If you wish, you could choose to skip this step. 11) Take a small rest, you’re more than halfway. Enjoy a piece of chocolate, or a few sips of a real Dr. Pepper! 12) Go back to the iron board and apply the letters individually, making sure you’re following manufacturer’s recommendations for proper adhesion. Step aside and let for cool five minutes. 13) Repeat the zig-zag stitch around each letter, being especially careful at the points/corners of the letters. Again, if you wish. This is not a necessary step. My machine started going crazy while I was preparing this and so I skipped the zig-zag stitching. 15) Take side rows and pin the white background fabric sides. Stitch along the edge, right sides together, using a quarter inch seam allowance. Repeat for each side. Iron seams open. 16) Take top and bottom rows and pin to the background fabric. Stitch along the edge, right sides together, using a quarter inch seam allowance. Repeat for each side. Iron seams open. 17) Review your new top and square as desired. 18) Sit back and enjoy your mini quilt top while drinking a glass of Dr. Pepper. Chocolate is recommended, but not required. You may choose to use this as a mini quilt top and finish in your preferred method of quilting. Or you could choose to have this be a block in a larger quilt. Please feel free to use the soda bottle template for other pops and sodas if you’re not a Dr. Pepper fan. The possibilities are endless! Thank you for letting me guest post today. I hope you enjoyed my little tutorial!